A weekly group for people who are dealing with collecting challenges. The group provides a place to talk and get support from peers in an informal setting. A focused, peer-led group that follows a proven step-by-step textbook guide to understanding why we clutter and how to change our thinking and behaviors. Weekly, schedule TBD 16 sessions over 20 weeks. Please contact Terri Byrne for details and pre-screening eligibility. An intensive, therapist-led CBT (Cognitive Behavioral Therapy) group to examine the underlying thinking behind hoarding and explore strategies for change. Weekly, schedule TBD. 16 sessions over 20 weeks. Explore skills helpful in living your life successfully, such as money & time management etc. Topics vary monthly. For family and friends seeking to better understand and support loved ones with collecting challenges or hoarding disorder. Drop-in support group for LGBT 55+. 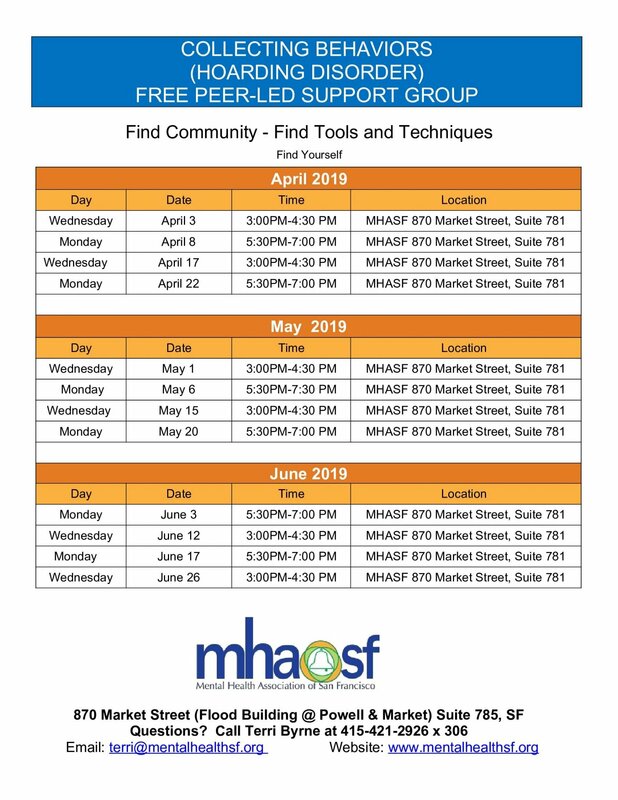 Facebook Group for MHASF Peer Peer Wellness Programs. Includes general wellness topics & issues related to hoarding behaviors.